The City of Riverside is the economic engine of Inland Southern California with a population of 326,792. Riverside is the largest city in the Riverside-San Bernardino-Ontario metropolitan area and is located approximately 60 miles (97km) east of Los Angeles. The city is centrally located along major trade routes and can be accessed via Interstate 215 and 15 from the north and south, and via the 91 and 60 freeways from the east and west. This close proximity to Southern California’s freeway network provides easy access to and from Los Angeles, San Diego, Orange County, the Coachella Valley and beyond. 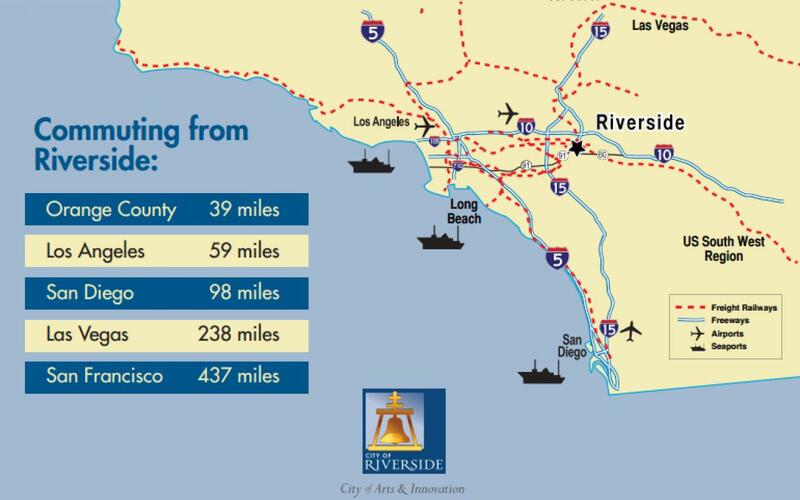 The city of Riverside is just 20 miles from the Ontario International Airport, and with over 110 foreign-owned establishments, it is the #1 city in attracting direct foreign-direct investments in the County of Riverside. The City of Riverside has several key partners to facilitate ​foreign trade and international investment. The City of Riverside has formed relationships with nine cities around the world to foster valuable trade and diplomatic connections.